This template has been written to cover international use because sites that would use such a template are likely to attract visitors from across the world. It has been written to comply with Australian law, but much is likely to be enforceable in many other legal jurisdictions as well. We have another very similar template if you operate a site that may be used by consumers (private individuals) as well as businesses. It includes provisions relating to rights under the Australian Consumer Law. 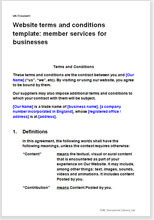 See Website terms & conditions template: membership based services. If your site creates a marketplace for goods or services (where buyers are connected with sellers and transactions occur through your site), one of our terms and conditions templates for marketplace websites might be more appropriate. See Website terms & conditions: marketplace sites.